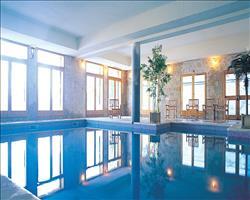 In addition all guests have free use of the indoor swimming-pool in the adjacent Altitude Residence. We update Chalet L’Ours Andin's details often, but facilities do change. e.g. some extras listed by the supplier as "free" or included might only be for the first time you use them, or for one time per party, then charged for further use. If any specific feature is essential to your holiday, make sure you ask us to confirm the details of it before you book your holiday.
. Ask for a quote when booking Chalet L’Ours Andin. 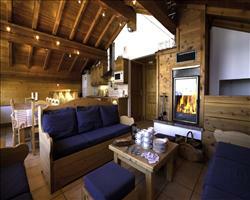 Chalet Marcel Les Arcs France, Belfast Int to Geneva 14th December. 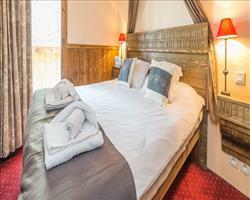 Chalet Gentiane Les Arcs France, Gatwick to Lyon 14th December. 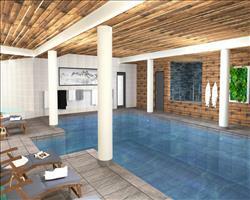 Chalet Herrison Les Arcs France, Gatwick to Lyon 14th December. 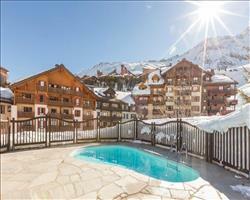 Chalet Marmotton Les Arcs France, Gatwick to Lyon 14th December. Chalet Himalaya (... Les Arcs France, Dover Ferry 19th January. 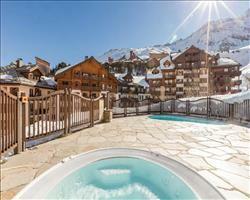 Chalet Bayona Les Arcs France, Gatwick to Lyon 14th December. 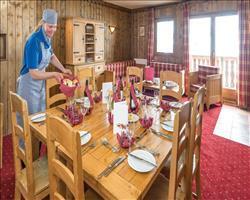 Chalet Fitzroy (A... Les Arcs France, Dover Ferry 5th January. 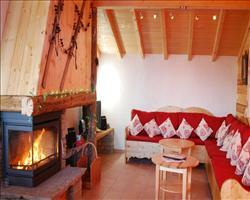 Chalet Roselin Les Arcs France, Gatwick to Lyon 14th December. 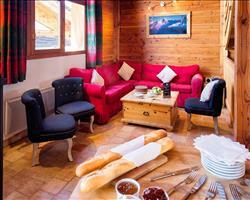 Chalet Alouette Les Arcs France, Gatwick to Lyon 14th December. "Great chalet, let down by the host"
The actual chalet was really good and I would give it a 5/5. It was all very clean and we had plenty of hot water. All the bedrooms were en-suite and had enough storage. You could ski down to the slopes and we’d had a big pile of snow so the skiing was easy. The ski hire was right underneath the chalet so it was all very convenient. However the host, an 18 year old lad on a gap year, just didn’t know what he was doing or how to communicate with anyone. The worst bit was that he had loads of his friends coming in and out, banging doors when the children were nearby. The children were old enough to know not to leave the chalet, but he always left the door on the latch which I wasn’t very comfortable with, especially at night. He was also quite rude, the kids tried to engage with him and we’d try and chat to him but he wouldn’t interact. It was really nice being all together, although we weren’t allowed to eat together which was a bit of a shame. We were meant to have a 4 course meal with chocolate and coffee at the end but it didn’t appear – the host said he had forgot but then he didn’t do anything about it. Although we had to wait a while for the second course, the food was lovely and the waiting didn’t bother us too much. "A fab Christmas in Les Arcs"
Our Christmas here was fab! The chalet itself is really convenient, the food was great and the staff were fab – I don’t think there was anything we could have moaned about. We couldn’t have asked for more. They really went out of their way at Christmas, the rep arranged for another guy to come as Santa and leave footprints in sugar by the fireplace, and they had a Santa in the foyer giving out chocolates. From the resort point of view, trying to get up the slope to get to the lift was difficult for the children and older people in our group. Other than that I can’t fault it. The ski shop is right underneath the chalet which was useful. Bedrooms were all fine. The chalet was generally pretty good. There were probably one or two small things that weren’t ideal. The set up with the chalet staff – there were staff coming and going whenever they pleased, including ones who weren’t looking after us who we didn’t know. It made the atmosphere a bit strange as you couldn’t really relax. The layout was good enough, although you had to walk through the kitchen to reach two of the bedrooms (could be a bit difficult when they were people in the kitchen) – however that’s just nitpicking! The food was great, and the location was only a short walk from the closest lift. The Whistler bar is pretty close and we all enjoyed it there. "Ground floor fast access to the slopes"
With the easiest access to the piste and lifts, this chalet is located on the bottom floor which is only 3 minutes’ walk away from the slopes and the free swimming pool (must check before you book) across the way where you can relax. 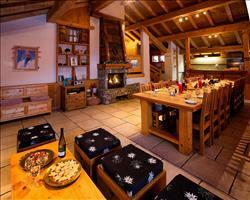 The chalet is cosy and warm, furnished to high quality with its open living area and fire place. It's a nice place to stay when skiing the Paradiski domain.